One of the beautiful things about being a creative person is that inspiration can be seen all around. Beauty can be evoked in the tiniest thing. This month we see how design influence comes from many objects and many places, the distant past and the ever-changing future. Learn about new colorways, popular materials, emerging consumer profiles, and in-demand styles. Must-see furnishings, textiles, ceramics, wallcoverings, paint, art and architecture are represented here from around the planet. Get inspired with the July edition! London — The Trendease Team has been full steam ahead scouting new talent at the various graduate shows filling up the calendar May through July. The materials seen in this gallery coincide with the published consumer types and analysis of global social, economic, and design trends. 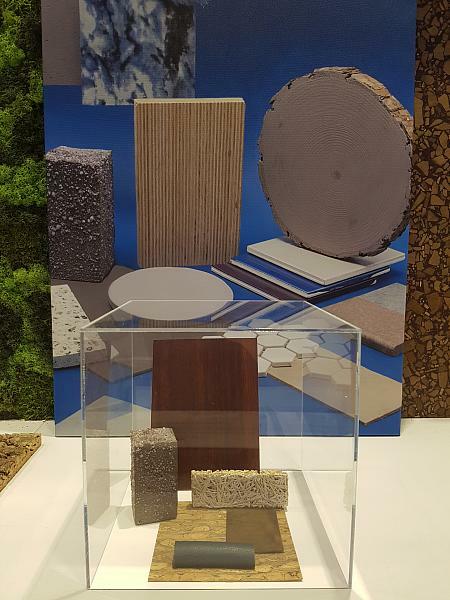 Moss, bark, cork, bricks made from construction waste, hay, felt, wood terrazzo, and cement are trending materials. Worldwide — During the Trendease scouting trip to New Designers, we observed the displays merchandised by paint manufacturer Dulux. In their most recent ColorFutures report three consumer types were outlined using the study done by the Global Aesthetic Centre. We thought it would intriguing to take their research and match it up with designs we have scouted during our creative travel adventures. Worldwide — This is another consumer type matched up with designs we have scouted during our global travel explorations, where we cross reference what we observe at international trade shows with lifestyle shifts detected in society’s behaviors. See examples of living spaces, furniture, dinning, and tabletop products in this photo gallery. Worldwide — Textiles that explore issues surrounding the digital age, installations showing the softer sides of technology, and collections that represent the globe trotter all represent products that the consumer group outlined within might purchase. Uncomplicated and multifunctional; bring the outside world inside. Worldwide — “Omotenashi” is a word we learned about when visiting in an exhibitor at Maison&Objet that was showing really funky toilets; a company that prides itself on seeking out “Japanese products and services that epitomize the spirit of ‘omotenashi,’ Japan’s unique hospitality, and presents them to an international audience.” Japan is not a new source of international design influence, but it is certainly making waves now. Worldwide — Those who have watched Ghostbusters, will be familiar with the plump figure known as the Stay Puft Marshmallow Man. Bibendum, in English the Michelin Man or Michelin Tyre Man, is almost one hundred years older than the sugary giant. What do these two imaginary figures have in common and how do they relate to the future of design? Find out here. Multiple Portuguese Cities — During last month’s excursion around Portugal, Jennifer was awestruck by the Portuguese azulejos. The word “azulejo” does not stem from the color blue (azul), but rather from the Arabic word meaning “polished stone.” Tiles are everywhere from architectural design to the decoration under your plate at the dinner table. Vast examples are on display here, bringing forth an abundance of inspiration. Multiple Portuguese Cities — The inspiration found in Portugal did not limit itself to the azulejos. The Portuguese pavement or “calcada portuguesa”, comes in countless mosaic patterns to decorate sidewalks, town squares, and pedestrian paths throughout the cities. Most common are the black and white designs made up from chunky basalt and limestone. Let these mosaics inspire! London — At part two of New Designers we were exploring thousands of new graduate projects, zig zagging up and down the aisles of the Business Design Centre in London. This week’s newsletter focuses on some projects based on community outreach, collaboration, sustainability, and passing down skills, all incorporating a pleasant design aesthetic. London — This newsletter highlights facts from an event this week on innovation in technology and marketing. Included are a bunch of tidbits gathered while sitting in on ‘How to Deliver a World-class Digital Experience by Taking a Gen-Z Approach’ by Ronald Cummings-John, the co-founder of Global App Testing. London — The Trendease Team has been sorting through thousands of new designers’ collections, scouting talent for the MoOD Launch Pads and Innovation Platform, as well as editorial inspiration. During this process we had the pleasure of meeting two designers who are taking a fresh approach to wood using such creative helpers as laser etching and marbling processes.